Social Sundays Picnic - Poached Salmon Salad with Quick Pickled Red Onions, Summer Gazpacho, and Blueberry Cheesecake in a Jar! - Live. Love. Laugh. Food. 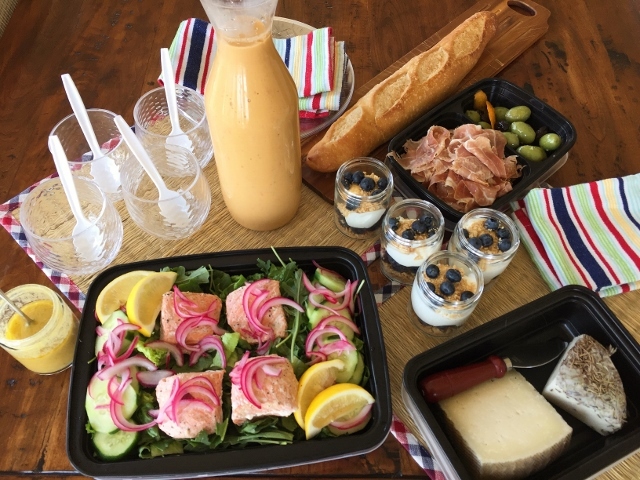 Social Sundays Picnic – Poached Salmon Salad with Quick Pickled Red Onions, Summer Gazpacho, and Blueberry Cheesecake in a Jar! Social Sundays is here and this week I thought we would go on a picnic either at the beach, in a park, or just stay home, and dine in the backyard. This menu is loaded with mostly no-cook recipes that can be prepared in minutes. The only cooking required this week is to poach salmon fillets on the stove top, which can be done in minutes. When I was a kid I loved a good picnic and I still do. There is something special about having a great meal in the open air and appreciating our surroundings. In addition to the Social Sundays recipes, I like to add a few extras to the picnic basket; like a block of good cheese, a baguette, sliced prosciutto and olives. They are no-cook additions that make the meal even more special. 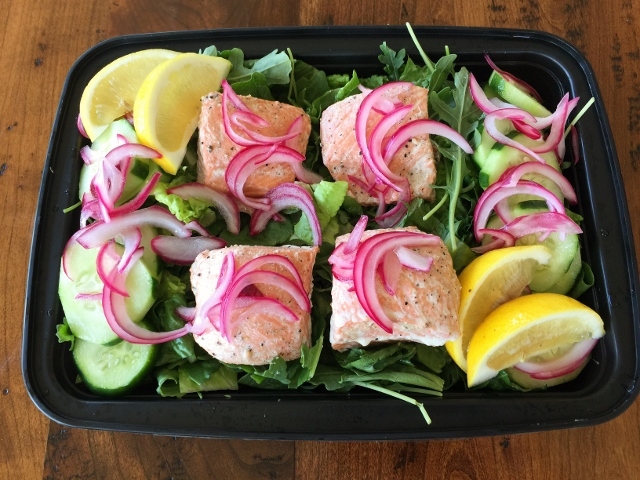 We start our Social Sundays Picnic with a light and refreshing Poached Salmon Salad with Quick Pickled Red Onions – perfect this time of year. You can find good salmon everywhere right now, and this salad will keep you cool and nourished during the summer heat. The flavors of this salad are mild and delicate, and the pickled red onion gives it a pop of perky flavor, it’s lovely. 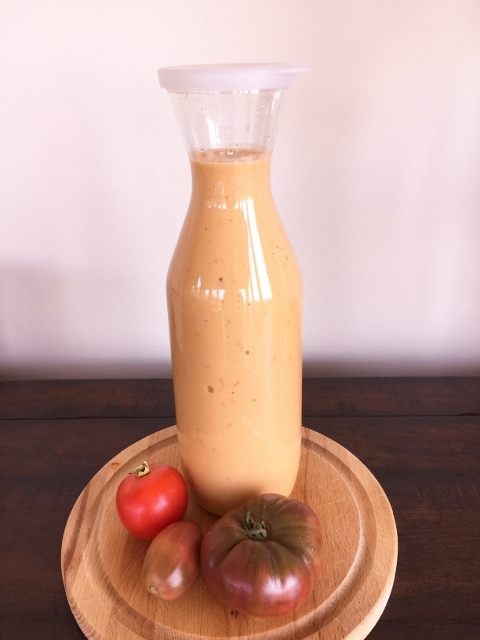 Our side dish at the picnic is Summer Gazpacho made with fresh yellow and red tomatoes, cucumber, garlic, fresh basil and French bread. 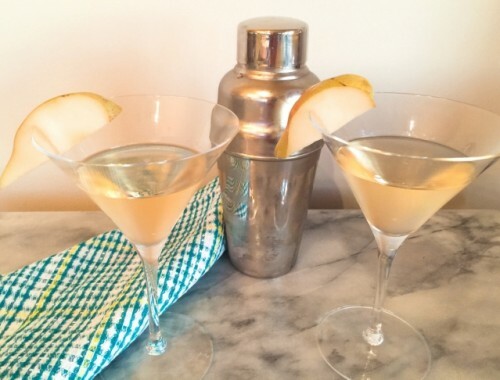 The flavors are tangy and sweet and oh so delightful. Gazpacho is the best summer soup, and after one sip, I’m sure you will agree. 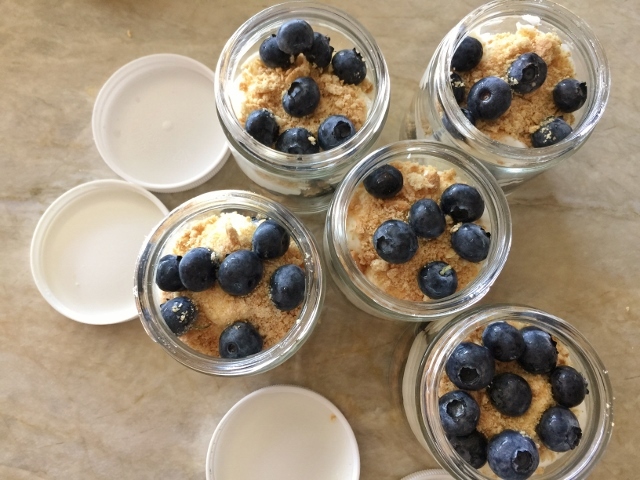 Blueberry Cheesecakes in a Jar couldn’t be more delicious and easy to prepare for a picnic. The trick to portable cheesecake is whipping up a cream cheese mixture using no eggs, so there is no need to bake. I tend to love blueberries especially in the summer, but if you have another berry on hand, go ahead and use it instead. 1. 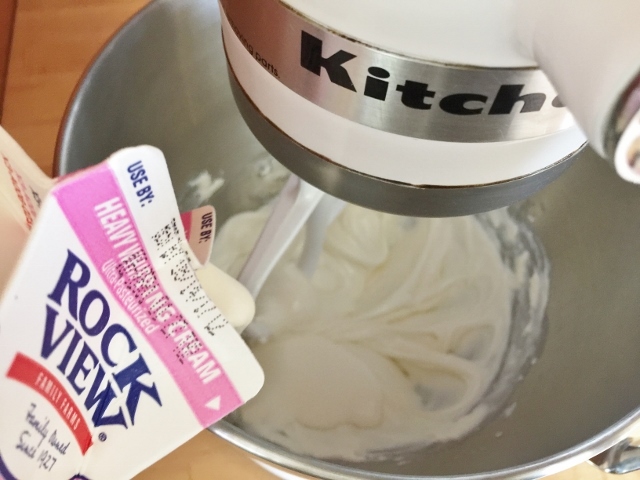 In a stand mixer or large bowl, mix together the cream cheese and honey on low speed for 4 minutes. 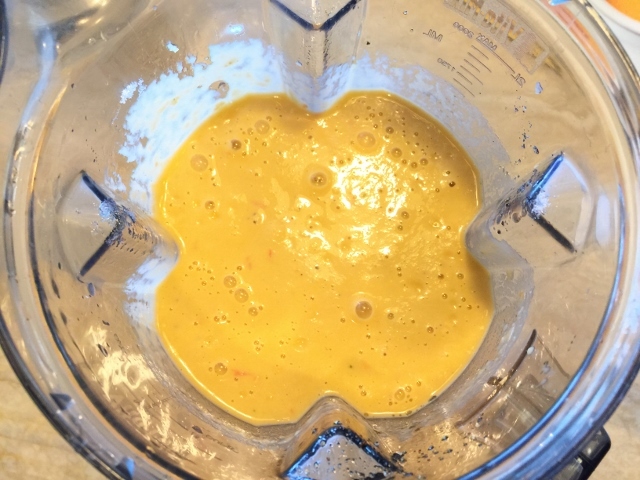 Add the orange zest and heavy cream and mix again for 1 minute. Set aside. 2. 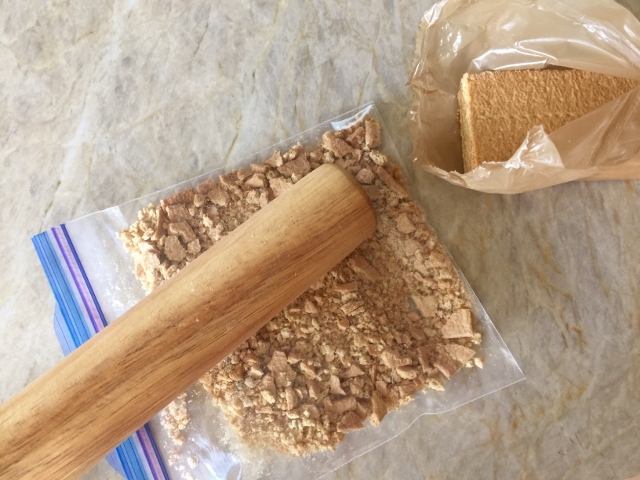 Place the graham crackers in a baggy and crush with a rolling pin. Place 2 tablespoons graham cracker crumbs into the bottom of each jar with fitted lid. 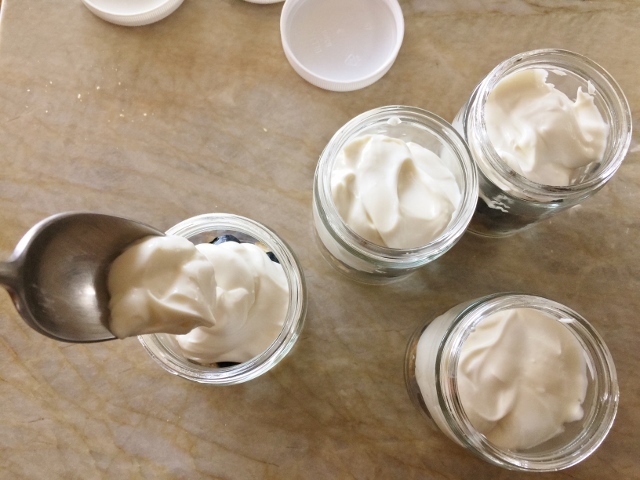 Then, add 1/4 cup blueberries and 1/4 of the cream cheese mixture to each jar. 2. 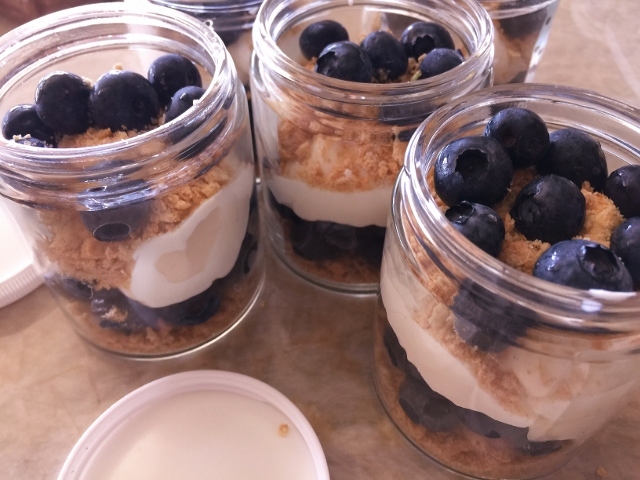 Top with 1 tablespoon of graham cracker crumbs and remaining blueberries. Seal jars and chill until ready to pack up and go. Enjoy! 1. 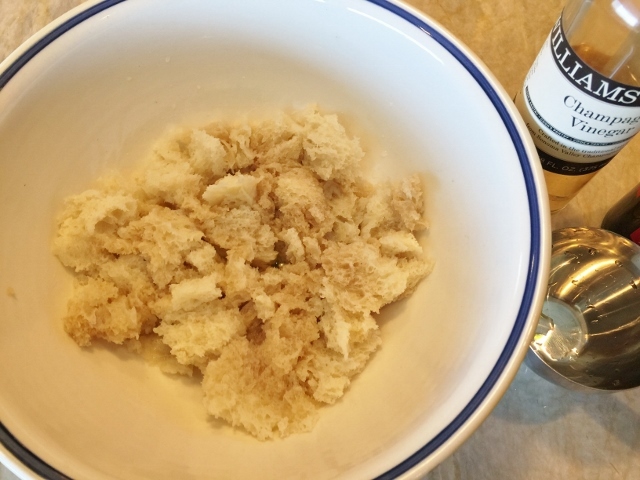 Place the chunks of bread in a bowl, along with the champagne vinegar and 1/4 cup water. Let soak for 10 minutes. 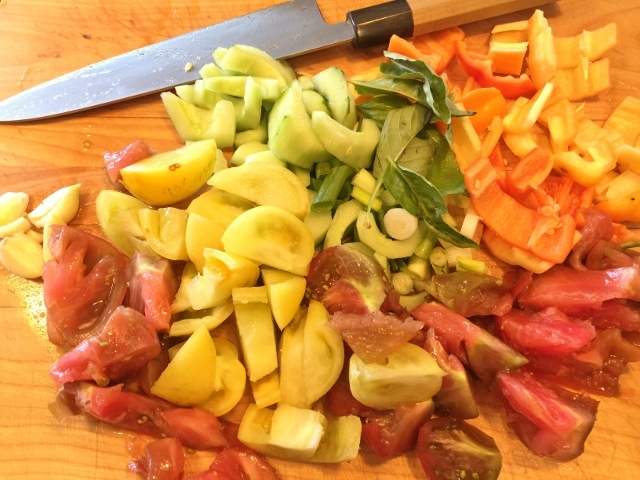 Slice and dice the scallions, tomatoes, cucumber and garlic. 2. 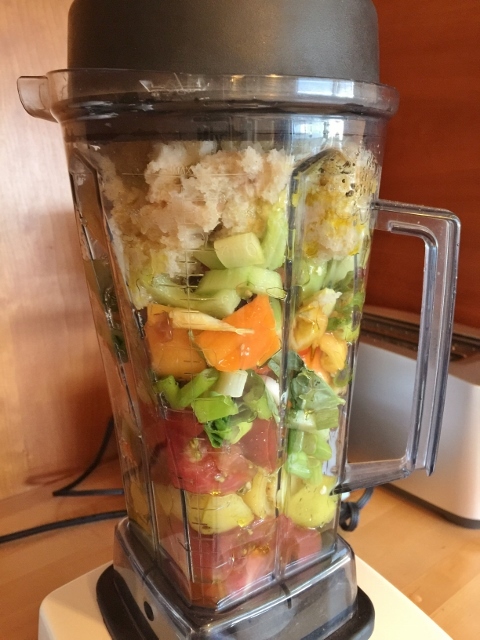 Add all the ingredients to a blender or food processor. If it won’t all fit, process in two batches. Puree until smooth, and pour into a 1 1/2 quart sized container with fitted lid, and place in the refrigerator to chill until ready to pack up and go. Enjoy! 1. 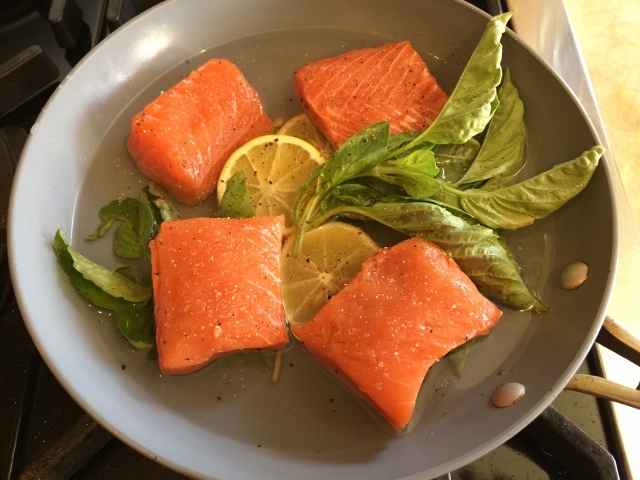 In a saute pan, add the salmon fillets, 1/2 sliced lemon, basil and fill with 2 cups water. Sprinkle the salmon with salt and pepper and place the pan over medium heat with covered lid, and poach for 5-6 minutes, or until the salmon is mostly cooked through. If you like your salmon slightly rare, cook for less time. 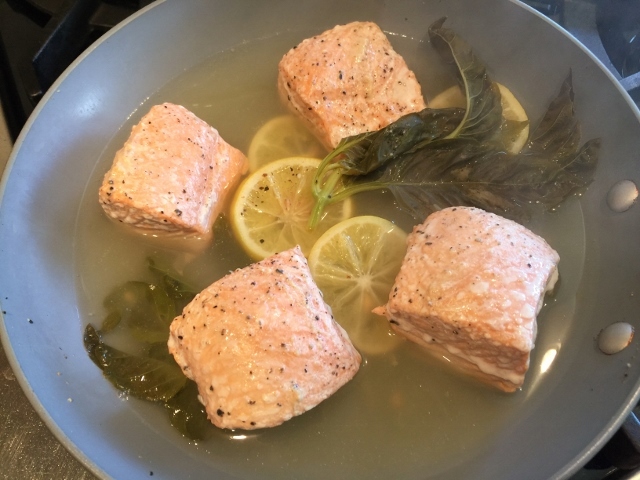 Remove the salmon from the liquid and place on a plate. Refrigerate the salmon until ready to assemble. 2. In a small saucepan, add the vinegar, sugar, salt and 1/2 cup water. Heat until boiling and pour into a bowl. Add the sliced red onions and let soak in the liquid, while you prepare the salad. 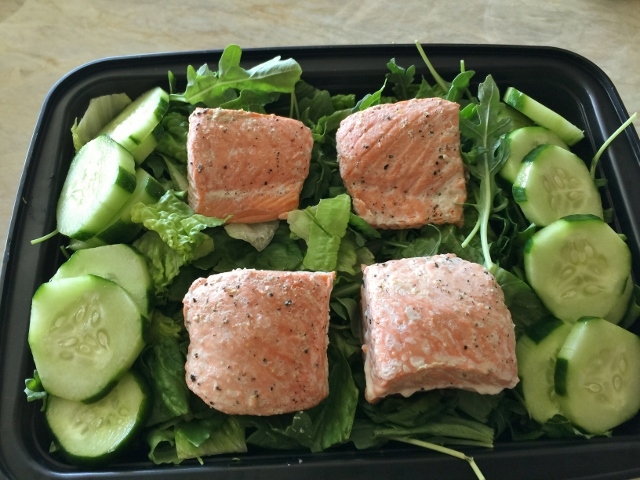 Place the lettuces in a serving container, along with the sliced cucumber, and set chilled salmon on top. 3. 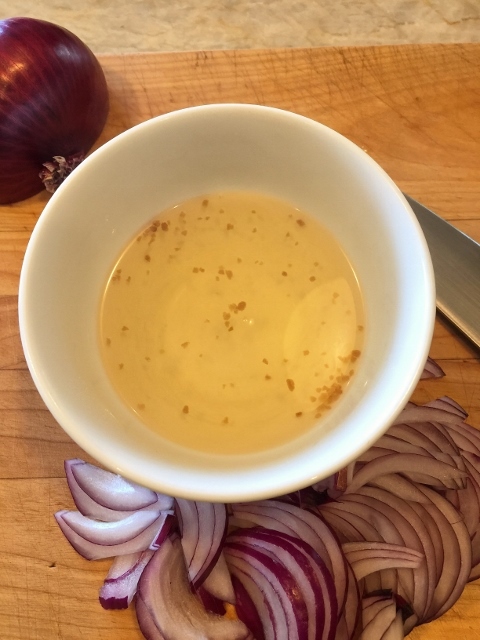 In a jar with sealed lid, add the vinegar, 1/2 shallot, honey, Dijon, oil and a pinch of salt & pepper. Shake until combined. 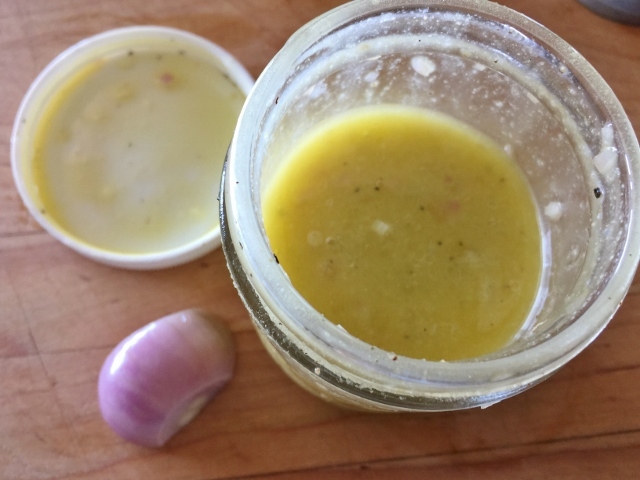 Place lid on top of vinaigrette, and place in the refrigerator until ready to pack. Slice the remaining 1/2 lemon into wedges and add to salad, along with 1/2 cup of pickled red onions. Save remaining red onions for another salad or sandwich. Place lid on salad container and chill until ready to pack up and go. Serve Poached Salmon Salad with vinaigrette at the picnic. Enjoy! 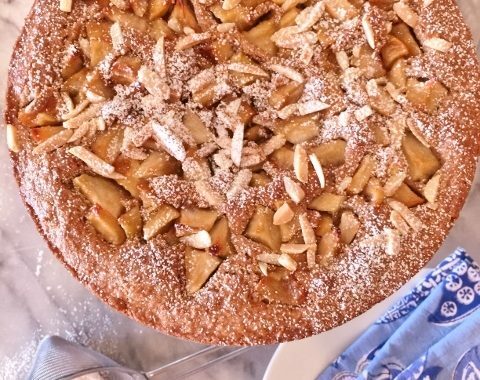 Apple Almond Coffeecake – Recipe! 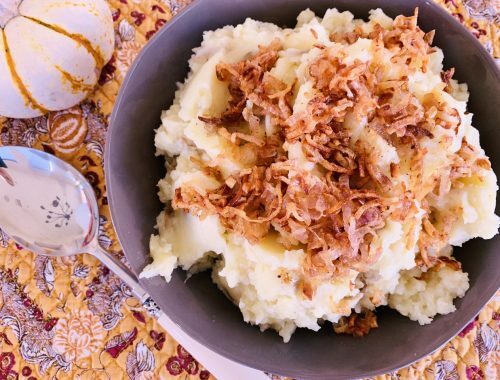 Rustic Mashed Potatoes with Frizzled Shallots – Recipe!